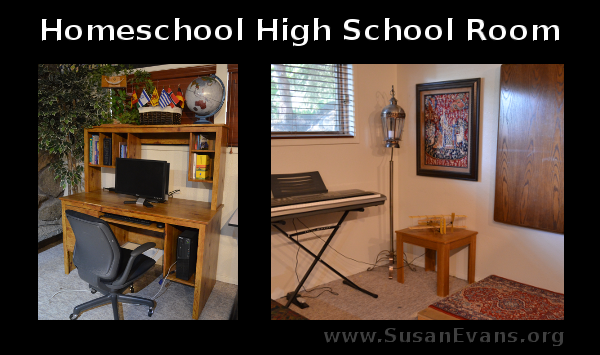 Come on a tour of our homeschool high school room! When a homeschool family transitions their students into high school, your homeschool space will begin to change. You will need an environment that looks more elegant and suitable for teens, not baby-ish. You want your teens to not be embarrassed to bring their friends over. First of all, you need a computer desk with a computer. If your teens take high school math at a co-op, you might not need this area as much as you would for a computer math program for upper level math. We use Teaching Textbooks for pre-calculus and other higher-level math. 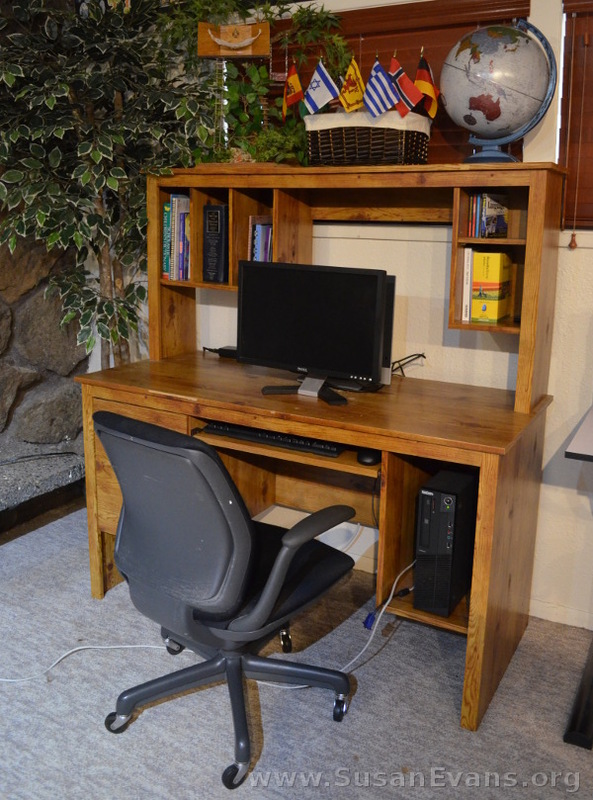 We also use computers for Spanish (Rosetta Stone), typing essays, studying Khan Academy for SAT preparation, etc. Your teens obviously need access to a computer in order to be computer literate. Also, if your teens have not learned basic keyboarding skills, you will want to make sure they know how to type fairly quickly before they go to college. On the top of the computer desk, you can have a globe, a model of something, or flags stabbed into some sand. Hands-on models for high school science can also be stored on top of the computer desk. To increase the elegance of the space, you will want to get rid of all the toys that your teens have outgrown. Bold primary colors are for younger kids, so earthy tones look better for teens and adults. You can improve your living space by adding good lighting and plants. If you don’t have sunshine, high quality silk plants can make your homeschool high school room look like a resort. You will want a desk or other flat space that is empty, so that your student has a place to work on vocabulary cards, tests, or any other written work. 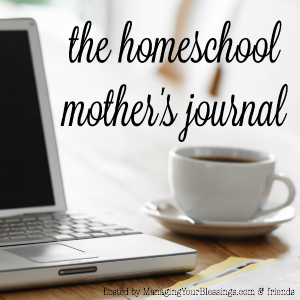 If you don’t have a separate homeschool room, you can always use your dining room table. One drawback of using the dining room is that if your teen is taking a timed SAT practice test or other timed test, they will be in a main thoroughfare instead of in an area where they can be alone without distraction. You will also want a white erase board, especially for your high school lab sciences. It doesn’t need to be as fancy as this one, which we picked up at a yard sale. You can probably find one at an office supply store, but a simple white erase board is equally effective. We used this white erase board especially for chemistry as we wrote out huge equations. We also used it for grammar lessons. 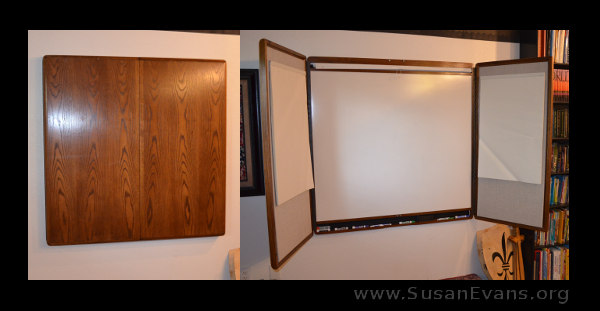 A white erase board is versatile and can be used to illustrate any point, even in history or Bible class. My husband made a small wooden platform for speech class or small skits. We placed a rug on top of the platform, as you can see in the video. I hope you enjoyed the tour of our homeschool high school room. This should give you some ideas for transitioning your students as they grow into teens! For hundreds of hands-on high school activities, join the Unit Study Treasure Vault! Organization Tip #1: Get rid of as much stuff as possible. 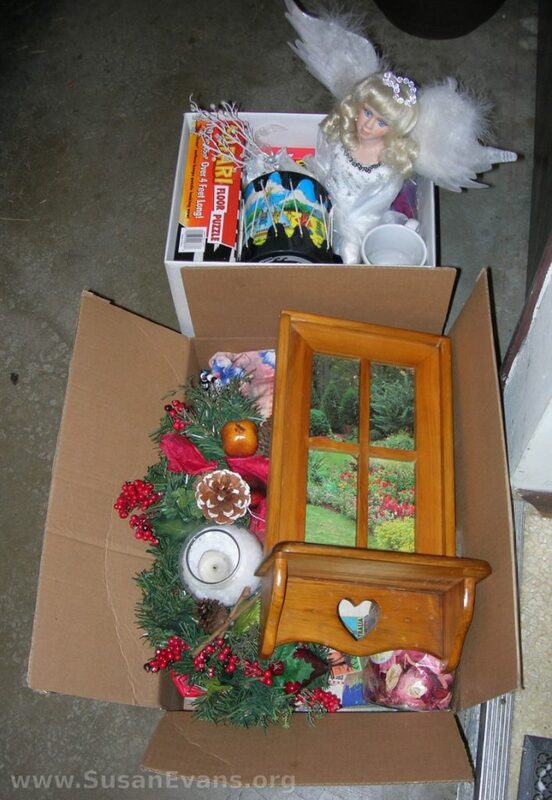 Make yourself a goal of filling up 10 boxes to take to Goodwill (or 3 boxes, or whatever). 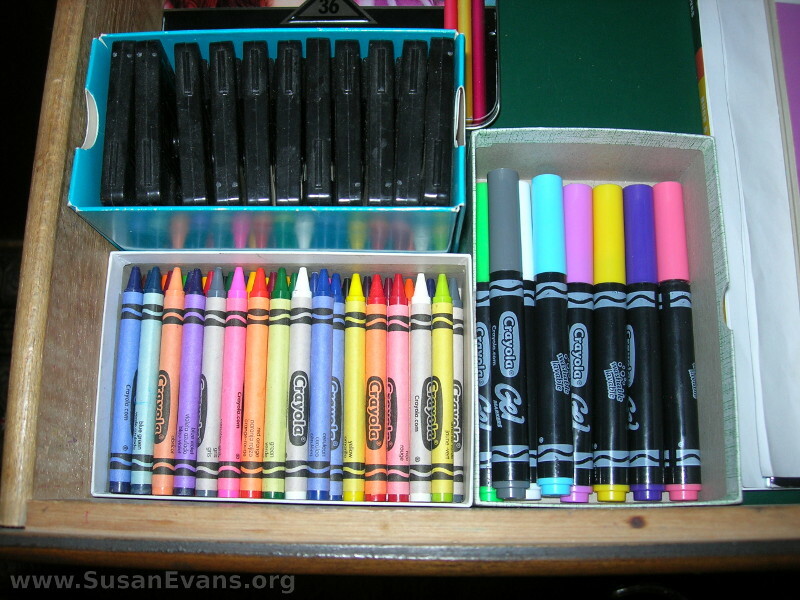 Organization Tip #2: Use small open boxes to organize art supplies in a drawer. 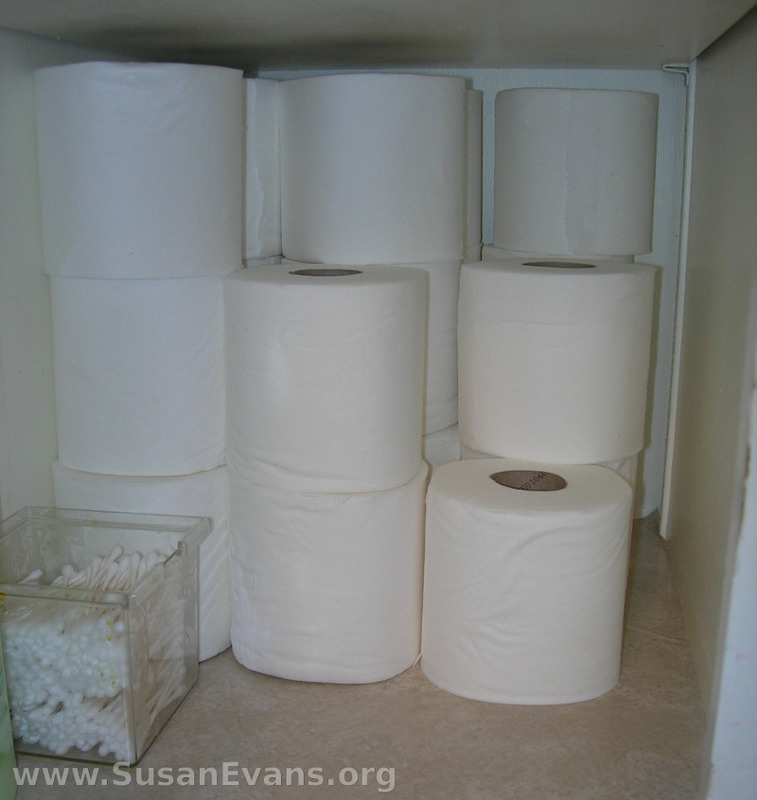 Organization Tip #3: Changing your cupboard liner can give your cupboard a fresh new look. Organization Tip #4: Making a list of to-do’s the night before will make you more productive the next day. Organization Tip #5: Do the hardest thing on your list first. Then you will feel relieved and have energy to do the rest. 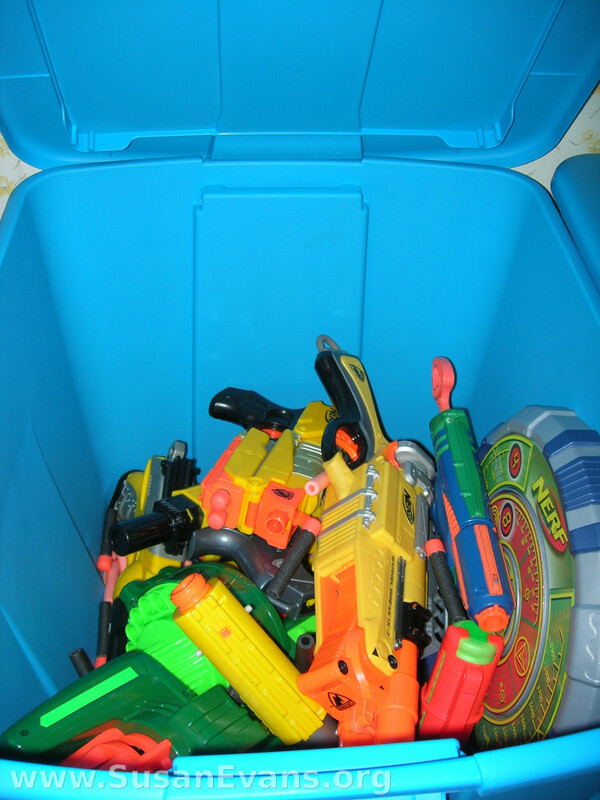 Organization Tip #7: Contain toys in bins. My newest bin is the nerf bin. 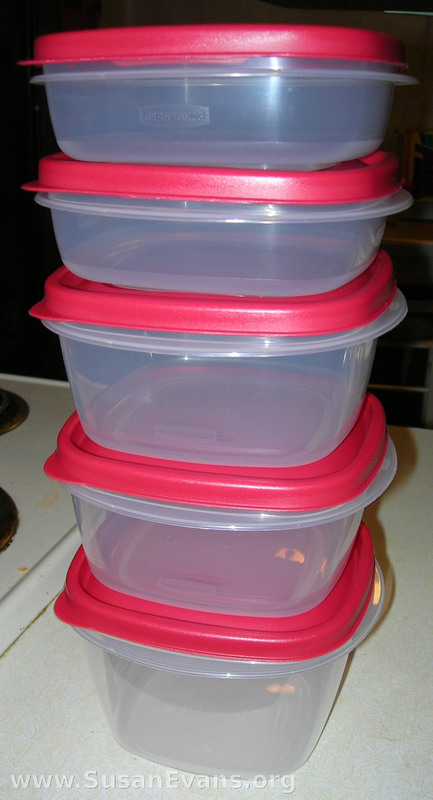 Organization Tip #8: Instead of fumbling with mismatched food containers, get a set that stacks. It takes up way less space in your cupboard, and it looks neater in your refrigerator. 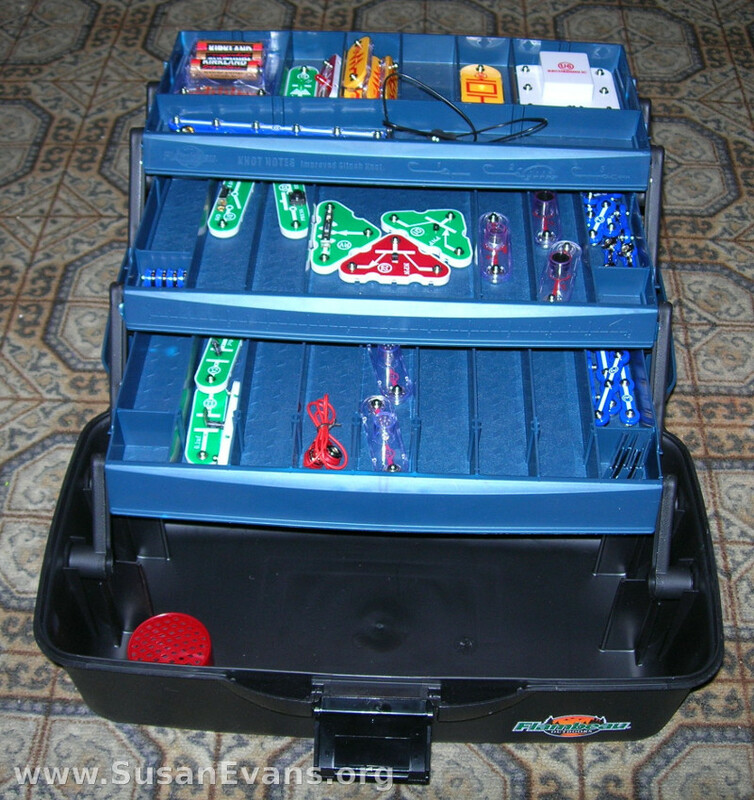 Organization Tip #9: Use a fishing tackle box to organize toys with small parts. Organization Tip #10: Eat protein in the morning. You will be a lot more productive with what you want to accomplish. 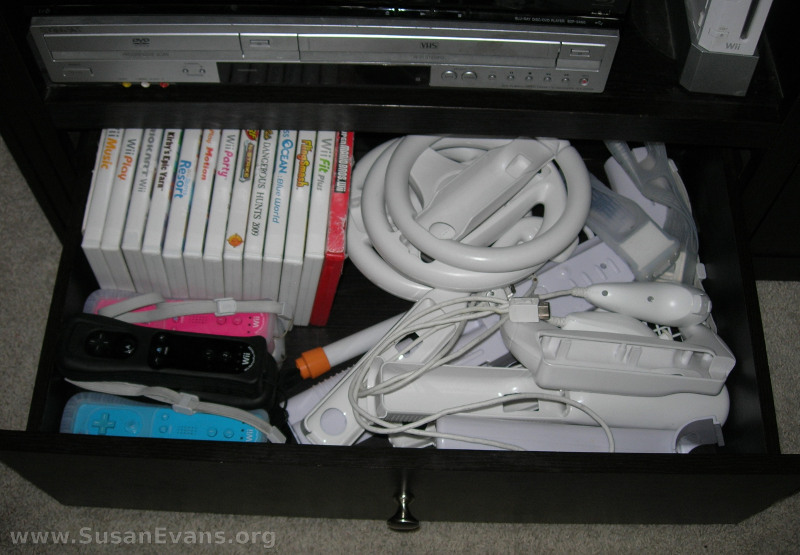 Organization Tip #11: My husband likes collecting Wii games for the kids. Pretty soon Wii stuff was all over the living room. I decided to organize all the games and accessories in a drawer under the TV. You could also store it all in a basket beside the couch. 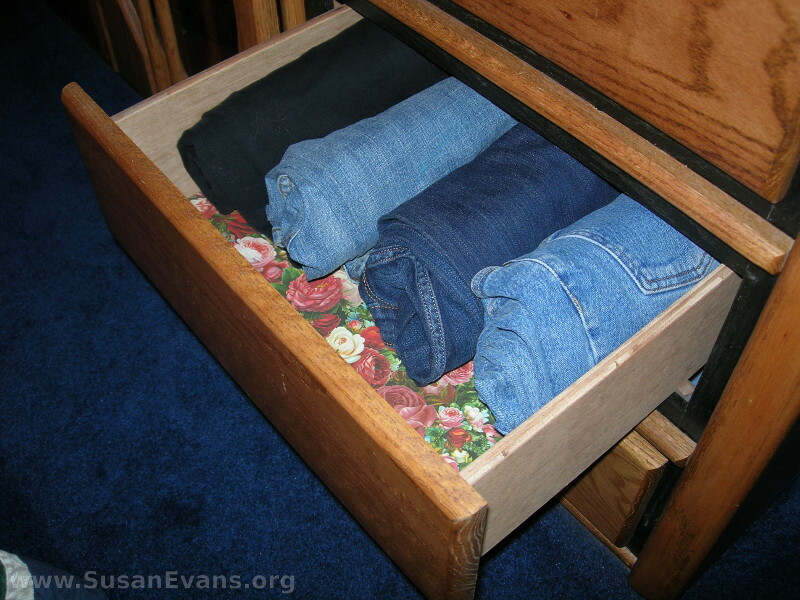 Organization Tip #12: Roll up your jeans to fit more in your drawer. 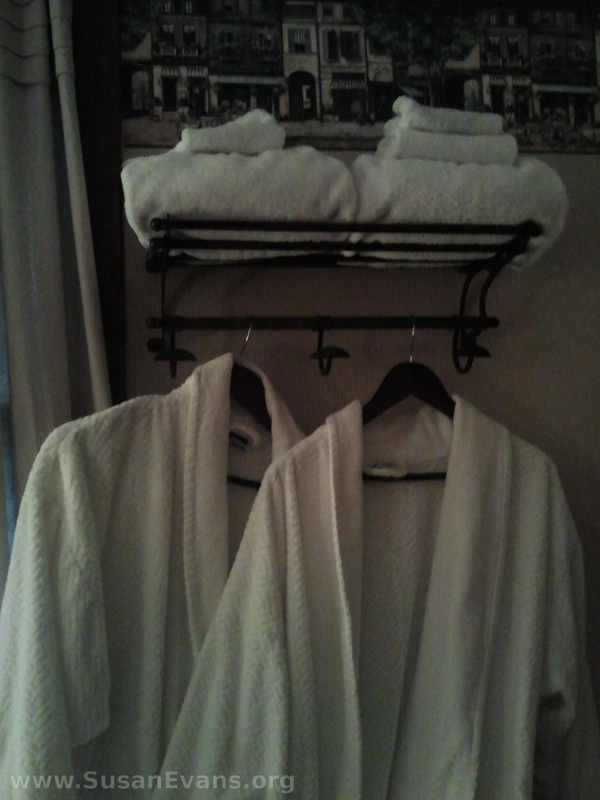 Find out more ways to organize your bedroom here. 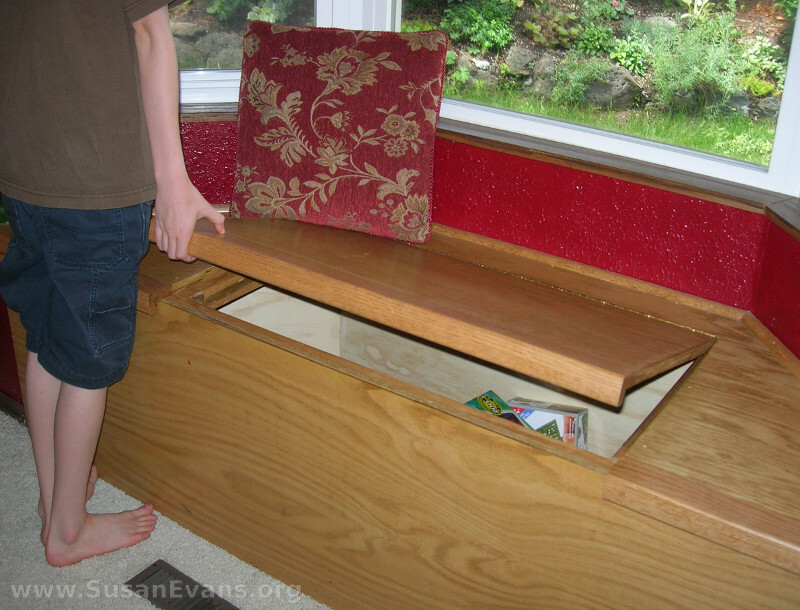 Organization Tip #13: Always look for furniture with built-in storage space. Find out how to organize a window seat here. Organization Tip #14: If you use something with small drawers for craft supplies, make sure that all your kids are above age 4. Otherwise the buttons (or whatever) will end up all over the floor. For younger children, I recommend a tackle box, which I show you in my “Organizing for a Fun Homeschool” video. 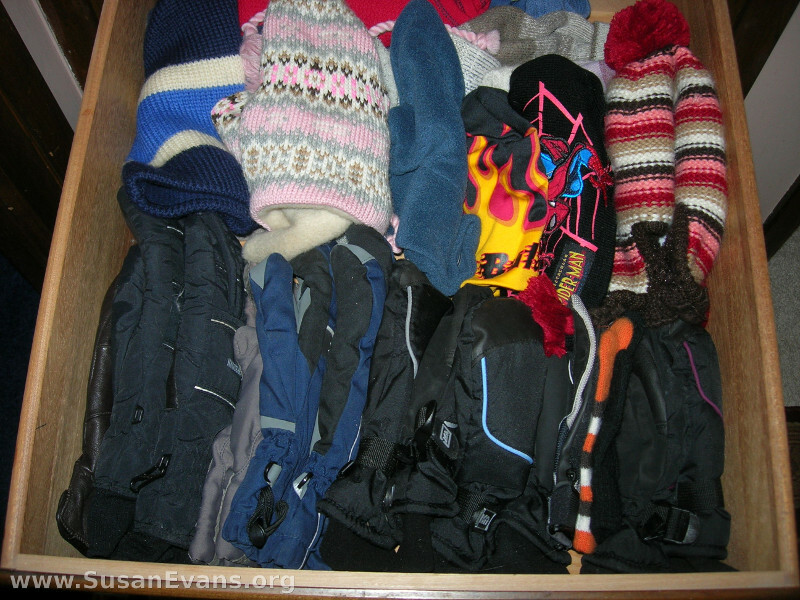 Organization Tip #15: If you place all the mittens and snow caps in a drawer from oldest to youngest in your family, everyone will be able to find theirs when heading out the door for some fun sledding. Organization Tip #16: Go through your DVD’s and only keep the ones you absolutely love. Store the remaining ones in a drawer near the TV. 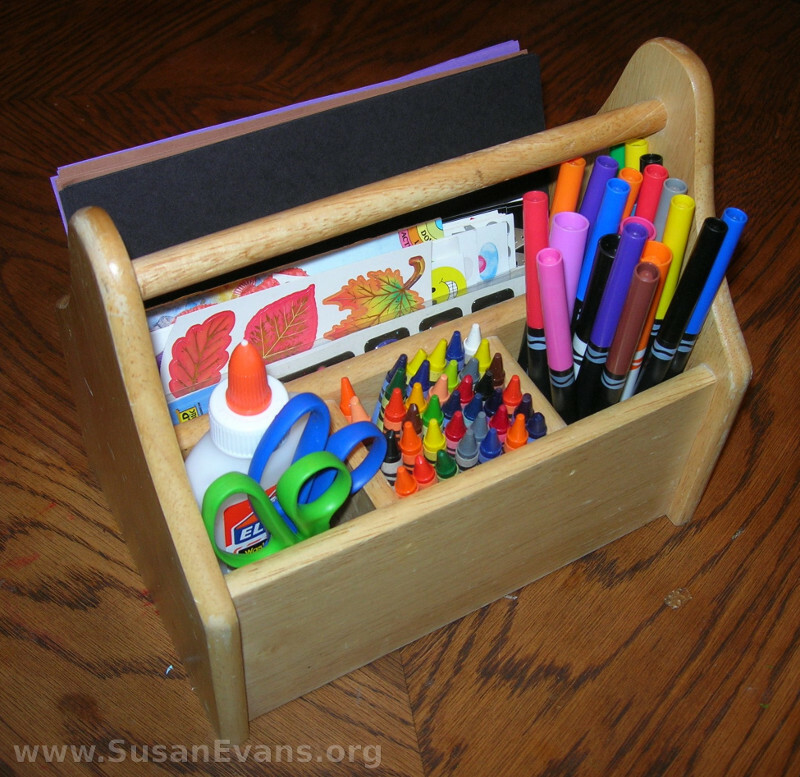 Organization Tip #17: My daughter loves a wooden tool caddie loaded with her favorite art supplies. 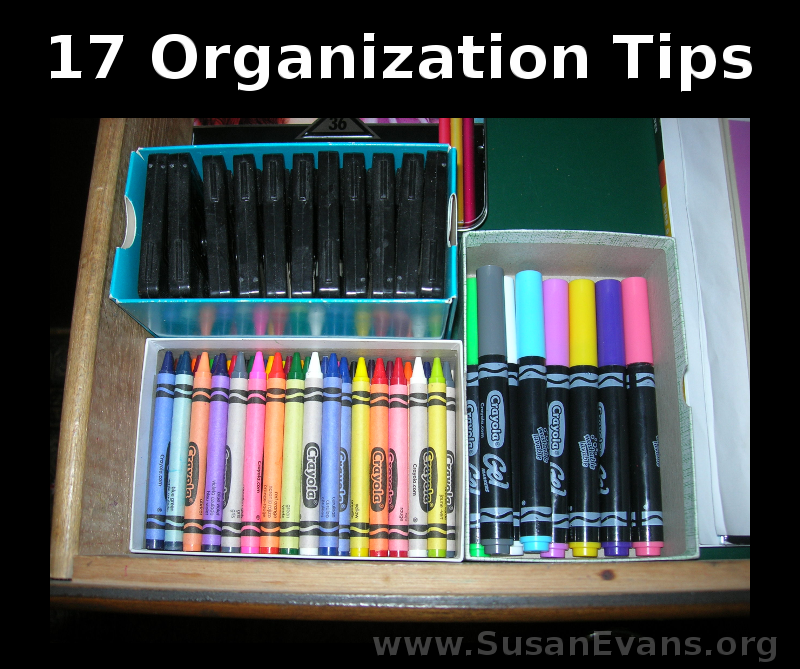 For more tips on organizing your house, check out my organization products. If you are wondering what we are doing for our high school homeschool curriculum this year, you have come to the right place. Today I will be sharing what we plan to use this year for our high school students. We are using Teaching Textbooks, and my oldest two sons (16 and 14) are taking Pre-Calculus. My third son (13) is taking Algebra 2, and my 11-year-old daughter is taking Pre-Algebra. I love this program because I don’t have anything to grade, and I don’t have to teach the material. This is especially important with Pre-Calculus, since I have never taken it in my life! I will not be doing every page from the above books, but I will pull the most helpful bits out to strengthen any weaknesses uncovered by the practice SAT tests. We will be doing a lot of essay writing as well, to make sure they are fully prepared for college. We will also be watching John Stossel DVD’s, which I ordered for free from his website. You can also watch episodes from his program (which used to air on 20/20) straight from his website. For 12 weeks: We will be watching the 20-min. 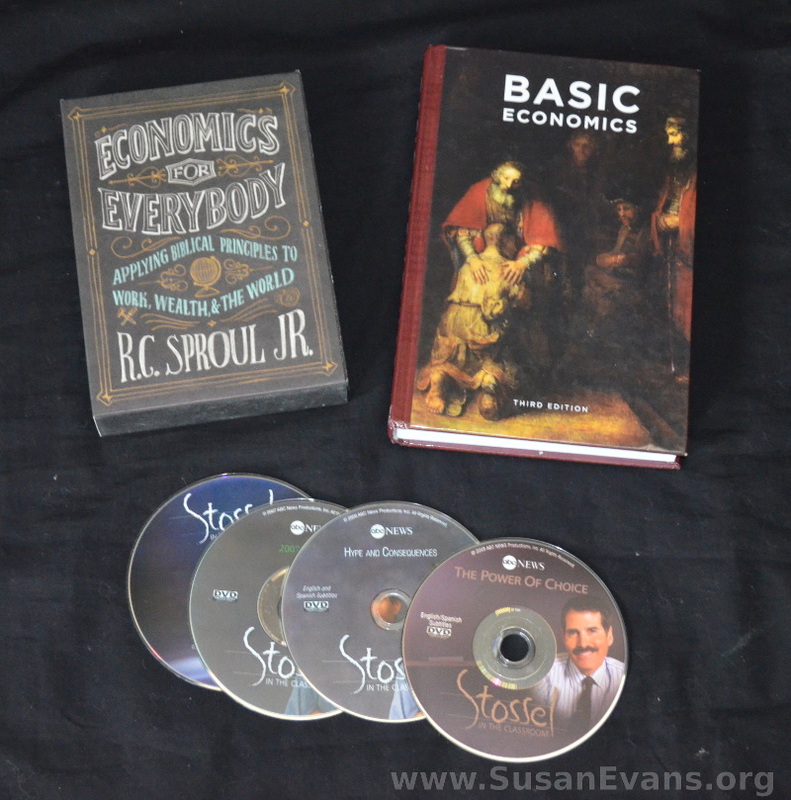 video of Economics for Everybody on Monday nights, followed by discussion questions. Then we will read one chapter from the Basic Economics textbook and answer those discussion questions. Wednesday night we will read another chapter and answer the discussion questions. I wanted my husband to be a part of the class because he is more in touch with current events and how they relate to economics. There are 12 segments on Economics for Everybody, and each week we cover two chapters from the textbook. The kids will read Honest Money on their own during reading time. My oldest two sons have already taken Biology, Chemistry, and Human Anatomy, and we filmed everything we did. These videos are inside the Unit Study Treasure Vault and are well worth the low cost of joining the site just for those high school science videos. Next year we will be doing Marine Biology and filming everything. My youngest two have not taken Biology yet, so they will be taking it this year. It is a prerequisite for Marine Biology next year, which all four of my kids will be taking. My older two will graduate next year with a phenomenal education including Shakespeare, great works of literature, theology of the Old and New Testaments, creative writing, classical art, etc. Because we do not do Junior High, we do six years of high school, so that we have school days that end by lunch–and we actually enjoy our lives! We did a year of Rosetta Stone during the summer. This coming school year we will do Years 2 & 3, and the following year we will do Years 4 & 5. I am fluent in Spanish, so I plan to do some fun field trips and activities to go along with our study. I would love to visit Guatemala where I grew up to show my kids what it’s like to live in a third-world country. We have been doing a class called Mixing with the Masters, and we will complete the class this fall. There are six famous artists with three art projects per artist for a grand total of 18 finished art projects. We are using this class for high school art credit, and we are learning a lot about the techniques of the great artists. Every year we read through the entire Bible on audio while eating breakfast. Earlier in 2016, we filmed unit studies of I & II Thessalonians all the way to Revelation. 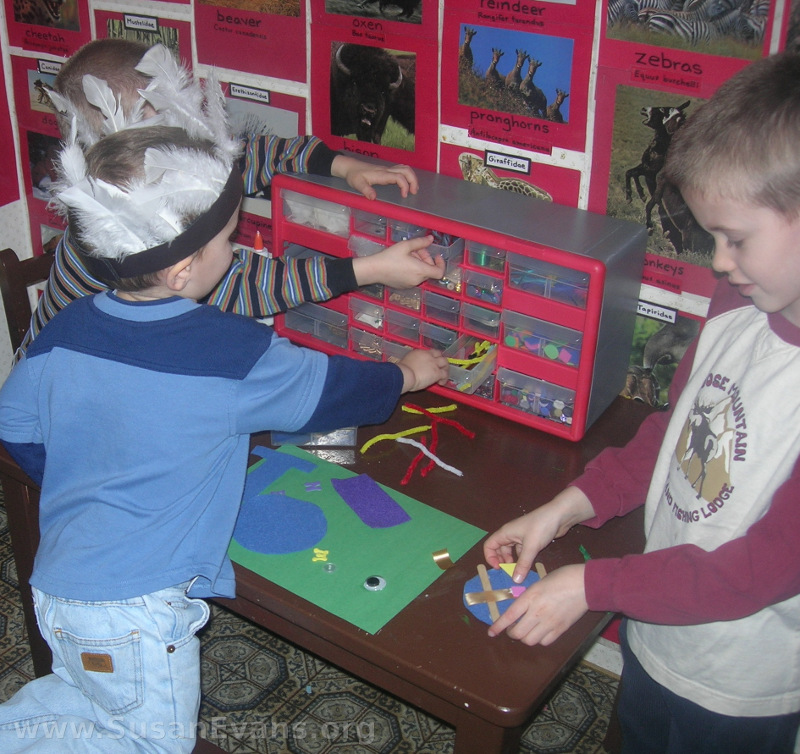 These included skits and other hands-on activities that brought the books to life. They are all accessible in the Bible section of the Vault. We also learned note-taking skills at church. Because of reading the three books listed above, we are behind in our yearly Bible reading and will need to boogy to get it done by the end of December! Oh, and my kids are watching this series for Bible class as well: The Bible Project. These videos are the books of the Bible explained in chart form in about 10 minutes with drawings. Phenomenal. PE is hiking and swimming and bicycling. 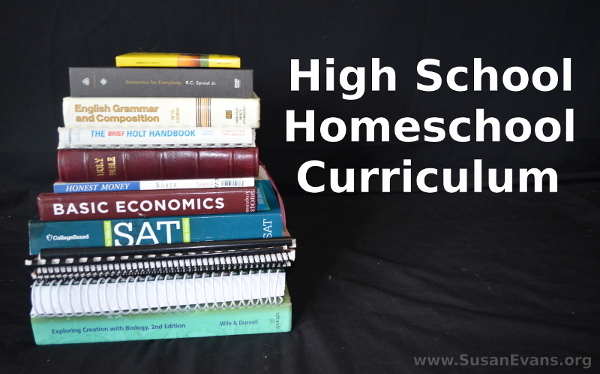 Linking up to Curriculum Week at iHomeschool Network. 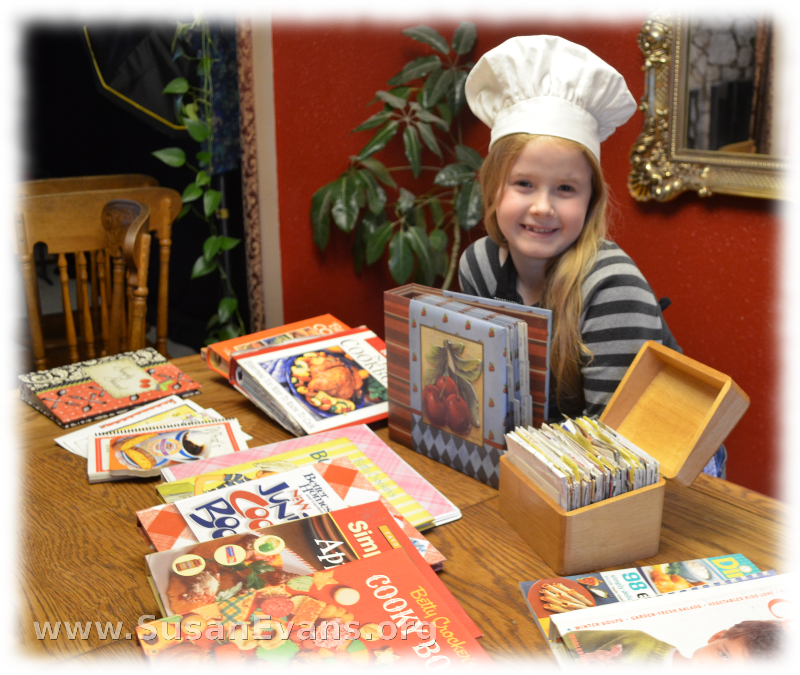 In this video, I show you how to organize recipes: the demonstration includes binders, boxes, and some of my favorite children’s cookbooks. My daughter loves to cook and wants to start her own recipe collection. If your recipe cards are jammed and you can’t pull out a card without pulling out a whole section of cards, it’s time to re-organize your recipes. 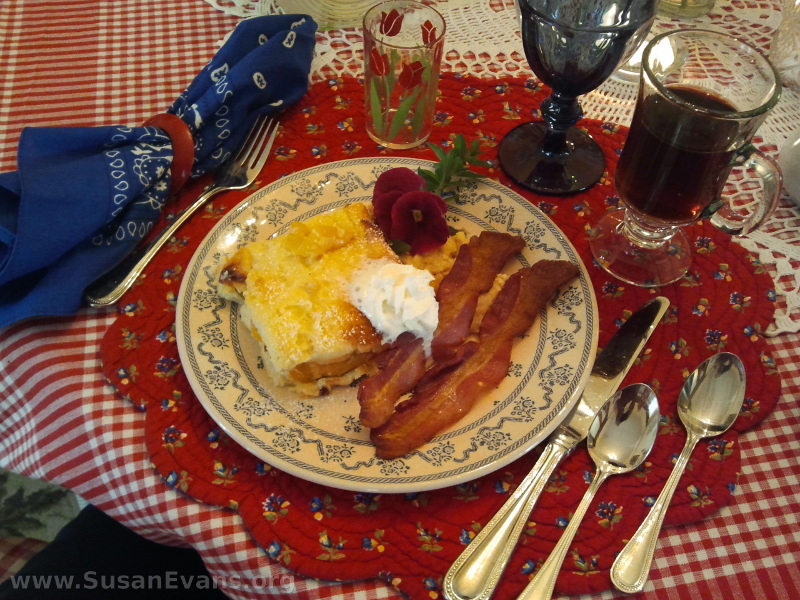 One way you can do this is to get a specially designed recipe binder that is similar to a photo album, but it has dividers for breads, meats, desserts, and other common categories you would find in a cookbook. You can get these recipe binders in most book stores or online. If you are low on money and want to create your own binder, all you need is a three-ring binder and some plastic sheet protectors. The thing I love about this way of organizing recipes is that you can tear out a recipe page from your favorite magazine and slide the whole page into the sheet protector. You might want to have a recipe binder like this in addition to your recipe box or whatever other method you use for organizing your recipes. 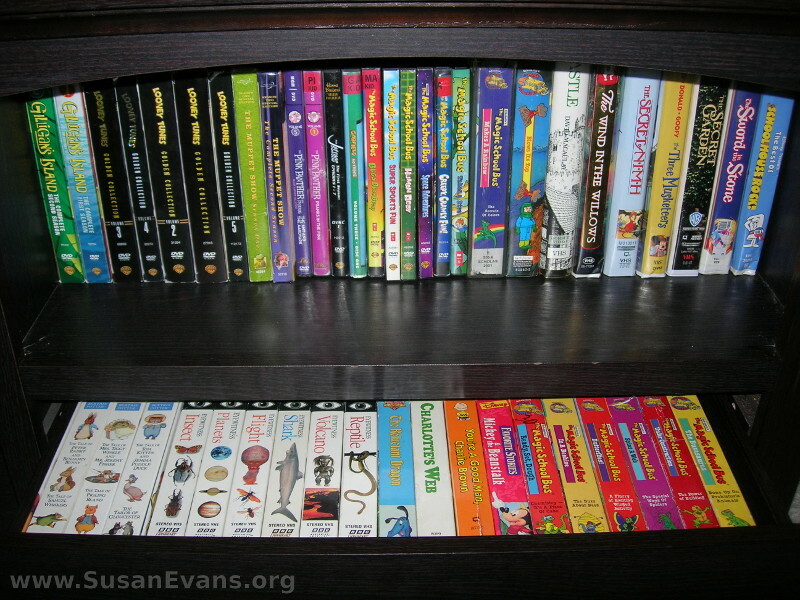 I showed you some of my favorite children’s cookbooks in the video, and the reason I love these cookbooks is that they are addressed to children and easy for children to use. If you can get your children to enjoy cooking at a young age, you will be instilling skills that will help them to survive for the rest of their lives! 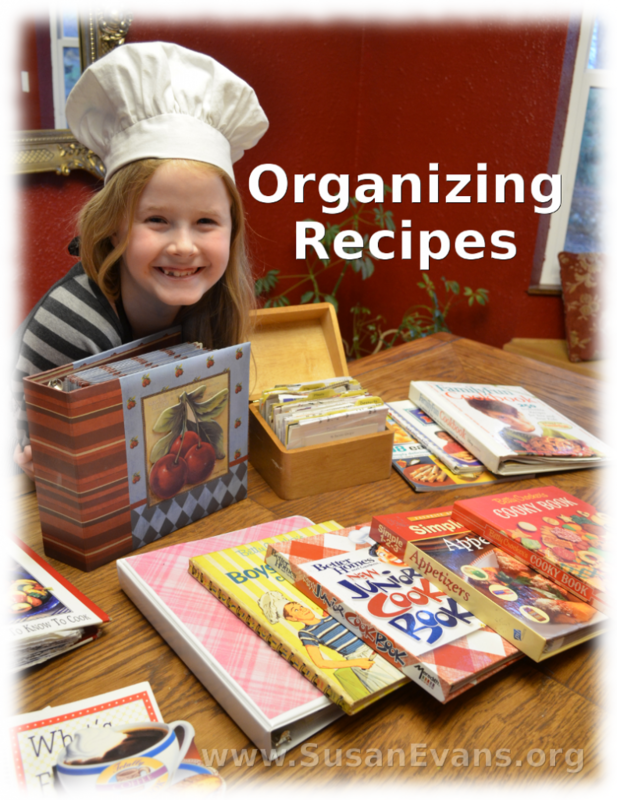 If you enjoyed this video on how to organize recipes, you will love Organizing for a Fun Homeschool.